The 2004 vintage is powerful, well structured and layered with considerable fruit. Pinot Noir and Chardonnay grapes from the House's 10 most celebrated crus are used in the production of this legendary cuvee. Tasting notes ... Intense aromas of white flowers, citrus and red berries then notes of toast and oak. White soft fruits, peaches and toast on the beautifully structured palate. The jewel of the Roederer House, created in 1876 for Tsar Alexander II. As an aperitif, to partner Chicken and Seafood or on its own! 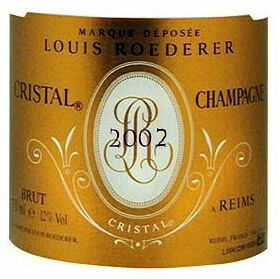 96 points"An explosion of fruit emerges from the 2004 Cristal, making a strong and very positive first impression. This is a wine of incredible finesse, length and balance that promises to develop beautifully over the next several decades." House Style: A passion for great wines and a desire to compensate for the limits that the "château policy" naturally imposes on the development of Louis Roederer Champagne have, over the years, driven Jean Claude and then Frédéric Rouzaud to acquire an exclusive group of properties around the Champagne House in Reims which, although managed truly independently, share the same philosophy of excellence, and today make up the "Louis Roederer Group". Initially founded as Dubois Père & Fils in 1776, Louis Roederer inherited the company from his uncle in 1833, renamed it eponymously, and set out to target markets abroad. With concentrated efforts in several countries, including Russia. Tsar Nicholas II nominated Louis Roederer as the official wine supplier to the Imperial Court of Russia, though the Russian Revolution and the U.S. Prohibition caused financial difficulties during the early 20th century, Roederer was re-established as a leading Grandes Marques producer and remains in descendants Rauzaud ownership. Cristal is a precursor prestige cuvée brand and was made commercially available in 1945.